Stephenson and Turner designed the Dunedin Hospital Boiler House more commonly knows as Dunedin Energy Centre. The first thing I notice about this building is the glass curtain wall. This is a key feature of modern architecture. This streamlined look is a mixture of metal framing with gleaming glass. I like this idea as it gives an insight as to what the building is like and also allows natural light to shine through. I found it interesting how the large windows open at the top of the building. Through the glass windows you can also see concrete square beams. Initially the building did not have the sign “The heat is on” however I feel as though it makes the building stand out more with the vibrant red colour. The building consists of a range of geometric shapes. 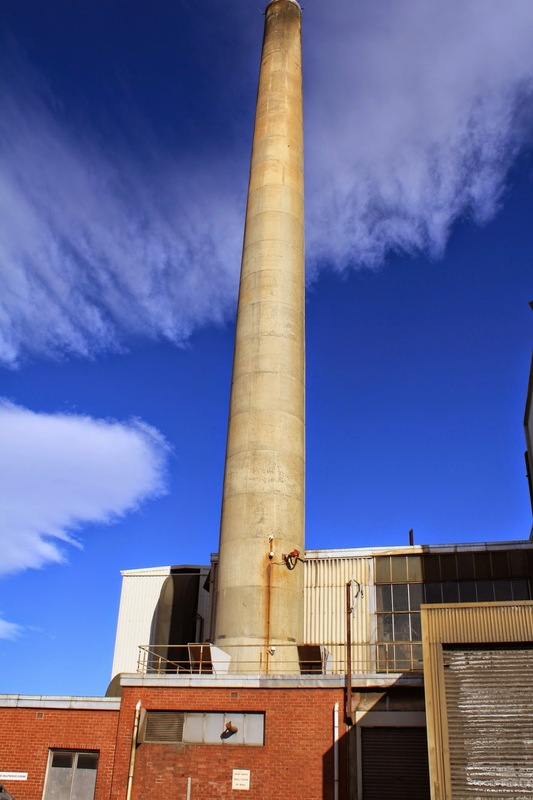 The large cylindrical chimney can be seen from a range of places in Dunedin due to its height and form. The building has a very minimal colour pallet that also has a modernist feel to the building. The bottom of the building is made from brick, then steel and glass. Energy is supplied to various places around Dunedin such as the Otago District Health Board, Cadburys and the University of Otago.